Between school and getting ready for my talk, I’ve not had too much time to get out the last couple of days. However, I did go to Marge and Tedin’s for a couple of hours Tuesday morning to look for Hoary Redpolls. Weather: Monday evening it cooled off a bit, but by Tuesday morning it had started raining. This left a layer of water on top of the ice at Swan Lake, which was still mostly frozen. Wednesday got pretty breezy, with rain during the day, but it started cooling off this evening. Birds: When I arrived at Marge and Tedin’s, the birds were pretty scarce. What few birds there were, seemed to disappear as I walked across the yard. However, there was one bird calling repeatedly from the tree by the corner of the house, though I never saw it well enough to be sure what it was. It sounded like it might have been a Pine Siskin. After I sat for awhile, the chickadees started to show up. It’s actually probably more accurate to say they became active, as I suspect they had been there the whole time. A lone Pine Siskin appeared near where I was sitting. At first it ventured only as far as the shrub beside the walkway. It seemed a little bedraggled to me, moving slow with strangely short tail feathers. It haltingly ventured out to the edge of the walkway picking up seeds that had been spread for the birds. Moments later a meteor of brown and white feathers with flashing bright yellow feet and sharp talons reaching toward the pine siskin shot into view. The siskin was off with the young Sharp-shinned Hawk giving fast pursuit, and that was all I saw of it. After a few minutes, the chickadees and juncos started tentatively feeding at the edges of the bushes. A few Pine Siskins and a couple of Common Redpolls appeared, but there still seemed to be much trepidation among the birds. It wasn’t long before they all quickly disappeared again. The finches would fly out toward the street rapidly in a group, with occasional stragglers shooting out at irregular intervals after, while the juncos melted back into the bushes and disappeared. One junco was frozen in a bush quite near where I was sititng, and it almost seemed to be looking up. I figured the birds must think the hawk was around, so I decided to get up and look. I was not able to see the hawk anywhere in the trees, but I didn’t have quite as much riding on it as the smaller birds. 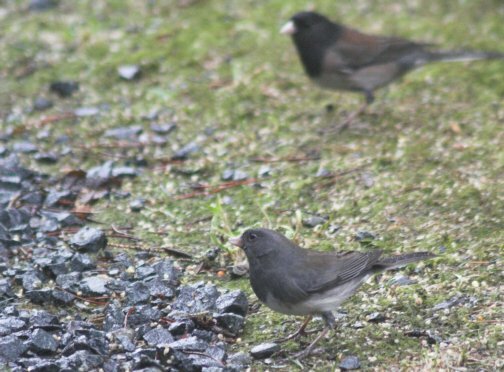 Finally, the tension started to lift and the juncos rematerialized on the ground at the edges of the shrubs. In among them was a Slate Dark-eyed Junco. The vast majority of juncos here are the Oregon form, and this was the first Slate form I had conclusively identified (see photo above). There was also a Golden-crowned Sparrow. I was still there when Marge and Tedin arrived back from their daily outing. They invited me in, so I sat with them and chatted for a bit. They said the yard birds were very jumpy lately, as they knew the hawk was around. Yesterday, there was at least 5 different times that the birds disappeared. They never got a good look at the hawk, though Marge said she thought it might have bumped one of the lower windows. By the time she got turned around, it was gone.